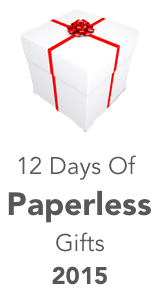 This is Day 7 in a 12 Post series: 12 Days Of Paperless Gifts. If you know someone who could use some help going paperless, or if you’d like to drop some hints, this series is for you. Don’t worry, the regular DocumentSnap tips will still be flowing. Back on Day 5 I said that at the very least you should have an external backup drive to protect your paperless documents. If your gift recipient already has one, I also recommend having paperless documents backed up offsite. The easiest way to do that is with an online backup service. Here are two services that are very highly regarded, one of which I use and one of which many DocumentSnap users use. Who is it for? : Mac, PC, and Linux users that want to be able to backup to their local computers and their friends’ computers for free, and an unlimited amount of data online for a pretty low fee. This is the backup service that I currently use. Who is it for? : Mac and Windows users who only have one computer to back up and don’t want to have a Java application slowing things down. Looking at the various descriptions for these services, it seems neither is fully satisfactory. The major objection to Crashplan seems to be that it is Java-based with the resulting security vulnerabilities and performance issues, i.e, no native desk-top clients, that brings. Apparently the needed Java run-time environment seems to be included with Crashplan and no longer has to be installed separately. Crashplan with native Mac OS, Windows, linux, IOS and Android applications would be very hard to beat. As it is now – I just don’t know. The objections to Backblaze seem to include the absence of backup versioning, the deletion of backups of disks that haven’t been connected recently, and the absence of some meta-data. Any one of these makes it a not-starter for me and having all three means that, as much as I’d like to consider Backblaze, I cannot. I am not yet clear on their respective treatment of NAS drives. And there are some pricing differences between them. Both seem to suffer from reliability issues for some people. So while I am wary of Crashplan, I am unable even to consider Backblaze. – with the ISP imposed bandwidth limitations in some markets. – imaging OS partition(s) and continuous backup of data, both initially to a NAS and then the scheduled backup of the NAS to the cloud backup service.